Image: Roi and Roi/Getty Images/iStockphoto. Ah, the Elf on the Shelf. 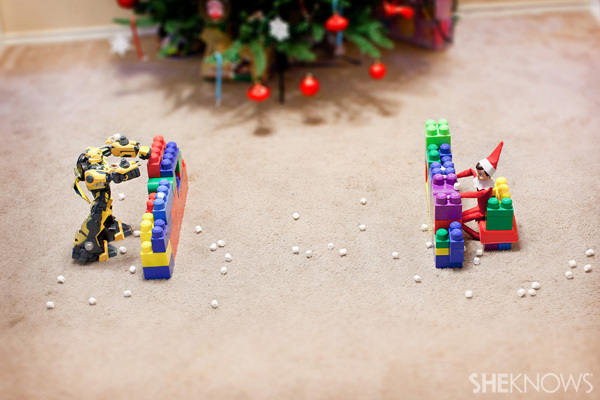 The bane of so many parents’ holiday seasons. Maybe you have a love-hate relationship (or, OK, a hate-hate relationship) with the wily little guy. But chances are, your kids love him. And hey, the internet loves him. He’s basically the best thing to happen to holiday mischief since Santa himself. 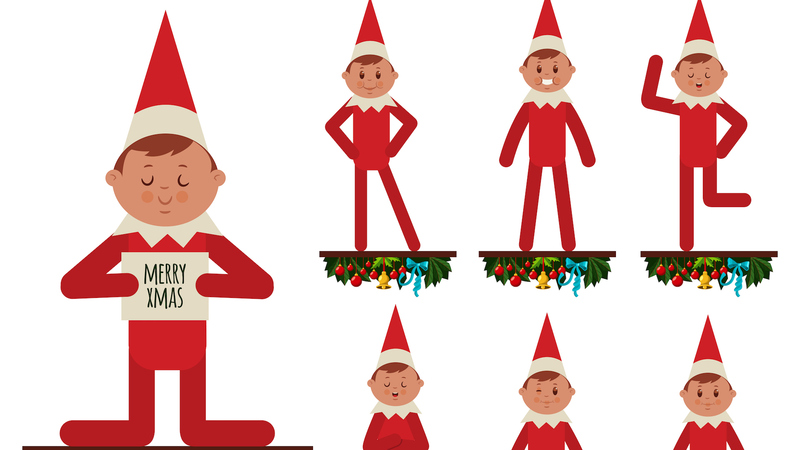 Although it can be fun to come up with your own creative ideas for where to place the beloved/dreaded elf (and we encourage you to do so) it can also be a little… exhausting, to say the least. So here are more than two dozen ideas to inspire you (read: ideas you can totally copycat) to get you through the holidays when your creative juices have been sapped by shopping. The premise behind the Elf on the Shelf is that Santa sends a special elf to your house to keep an eye on your children throughout the holiday season — you know, to make sure they are behaving. At night, when everyone is asleep, the elf — what with his magic powers and all — goes back to the North Pole to report to Santa on who was naughty and who was nice. Elfie’s antics are definitely the highlight of our holiday season, and with each Christmas Eve (the day Elfie goes back to the North Pole to stay until next year), the kids tell him goodbye and talk about all the fun memories we’ve had with him over the past weeks. 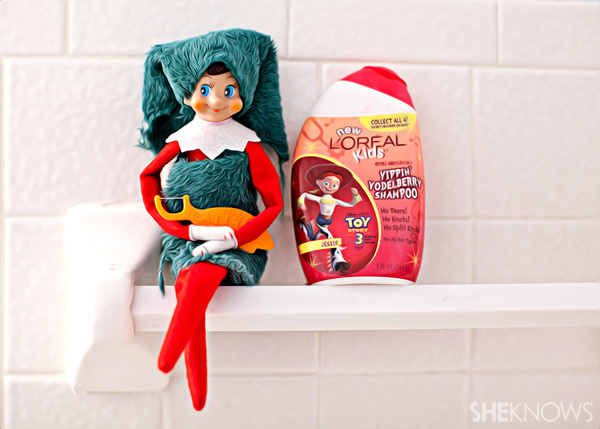 Our sneaky li’l Elfie Rojo was found in the children’s shower up on the towel rack this morning. Elfie looked like he had just finished taking a bath and flossing his teeth. For this setup, I took an old rag and fashioned it around Elfie’s head — and then slipped in a flossing stick for good measure. Of course, upon finding him, I commented on how it looked like Elfie was trying to remind the children to take baths at night and to keep their teeth brushed so they won’t get cavities. 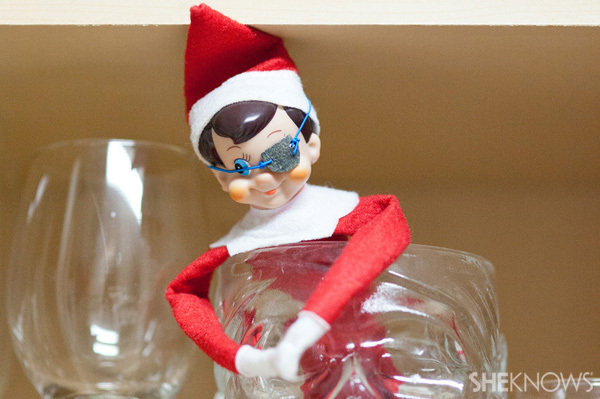 Not all of Elfie’s pranks have to be silly; why not throw in a life lesson or two? 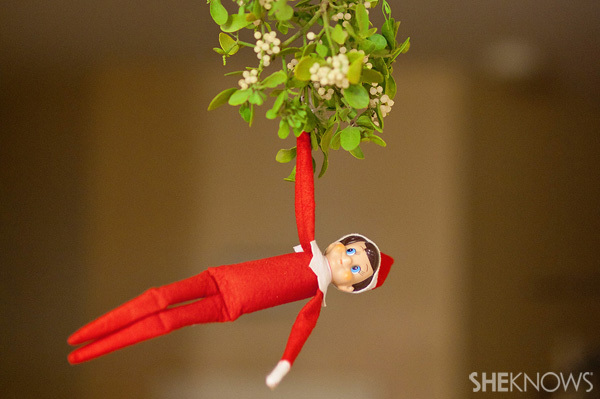 Elfie was found in my daughter’s room riding one of her butterfly decorations that hangs from the ceiling. Our family had just recently watched the movie Avatar, so the kids thought Elfie looked just like Jake Sully, the main character in the movie, riding one of the mountain banshees. 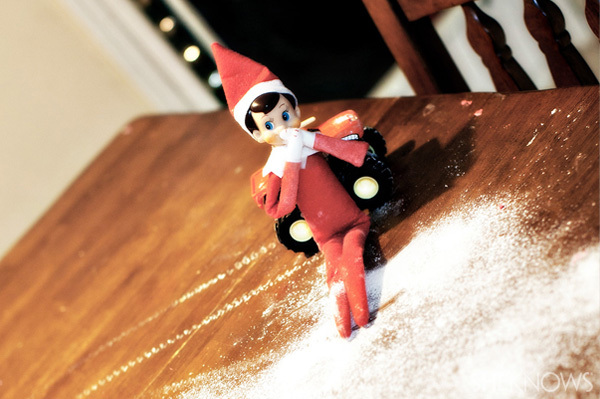 In this Elf on the Shelf idea, the kids found Elfie making “snow” angels on the kitchen table and didn’t know whether to laugh or worry Elfie would be in trouble. I pretended to be scolding Elfie for making such a mess, but the kids defended him and happily agreed to clean up the “snow” (aka flour) so that he wouldn’t get in trouble. 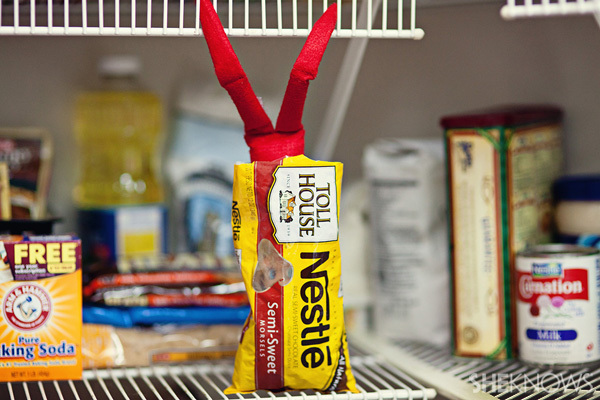 Here’s a little tip: Double-sided tape helps to get your elf’s hands to stay where you need them. 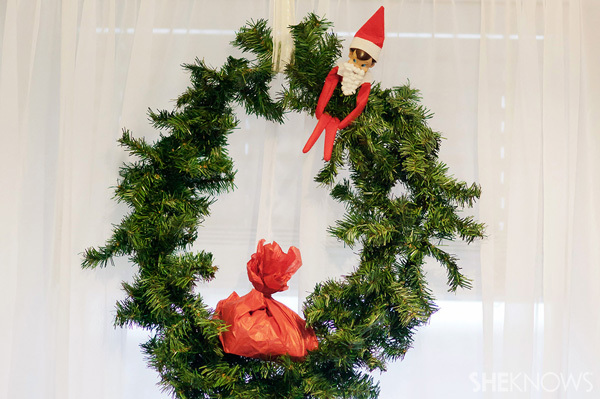 Or you can always try this bendy-elf DIY. 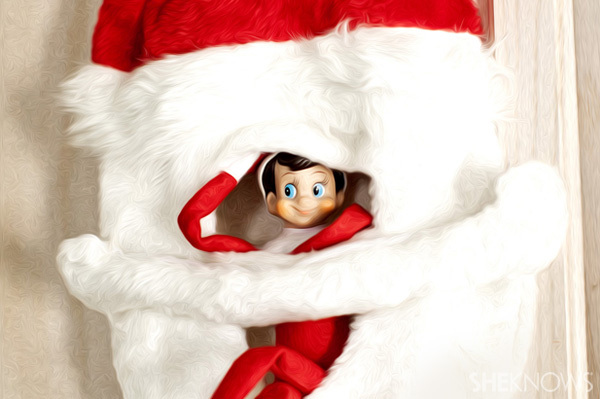 Once again, Elfie Rojo was quite the prankster on this day. He decided to take down all our Christmas stockings and switch them out for each family member’s underwear. Maybe he wanted to start a new trend? The kids thought this was quite hilarious. I was, however, a bit mortified when my neighbor decided to pay us a surprise visit and my undies were out for the world to see. I have a little doll bed that I use for my newborn photography sessions, but Elfie thought it made for the perfect snuggle spot for him to read a book in front of our Christmas tree. I think we bought this extra-tiny Christmas board book from the dollar store; it was the perfect size for Elfie to read. 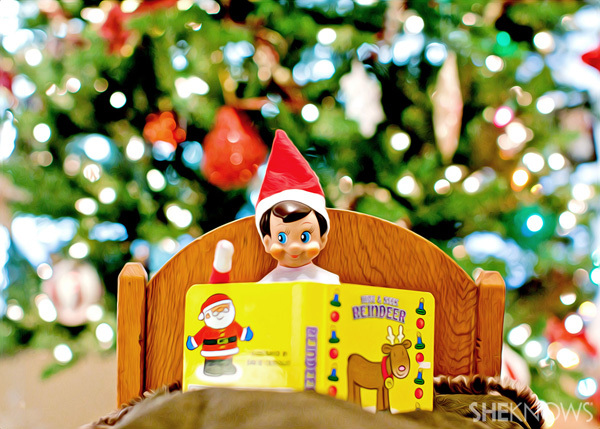 This elf setup can also be a good reminder for children to practice their own reading. 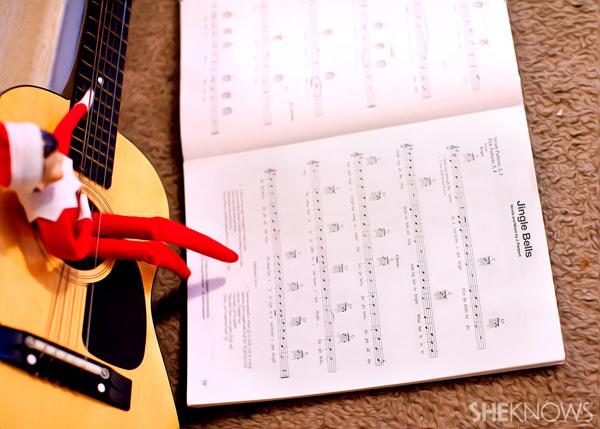 One day, Elfie Rojo was practicing the guitar when the kids found him. Nestled into my guitar strings and with my music book opened to — what else? — ”Jingle Bells,” Elfie was ready for some carols. This one was a bit difficult to do. I knew the boys had to be completely asleep, since I was going to be setting this up in their room. I hung ribbon from the ceiling to the other end of the wall and then taped Elfie’s hand to a candy cane creating a zip line. We had recently spent a weekend at the Longhorn River Ranch, where there’s a zip line over the river; the kids really wanted to do it, but it was just too high for them. They thought it was neat that at least Elfie got to zip line. Idea 8: Elfie Rojo loves ice cream — who knew? I hung the tail end of a Santa hat in the kitchen cabinet and then sat Elfie into the mouth cut out of the beard attachment. Not sure Elfie fooled any of us with his disguise, but the children thought it was funny. Of course, this made it difficult getting to our plates and bowls in the cabinet (since we aren’t supposed to touch or move Elfie, remember?) but we managed for one day. 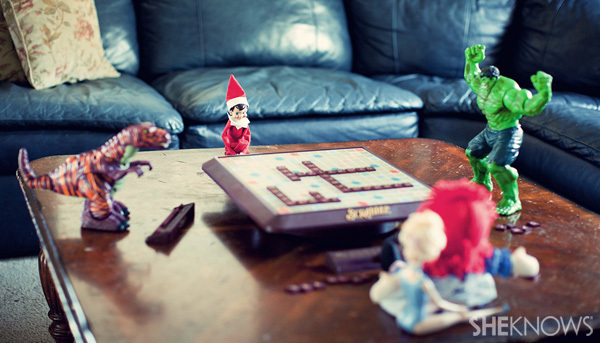 Elfie Rojo, along with Hulk, Raggedy Ann and T-Rex, were found playing an intense game of Scrabble this morning. All the words on the board had something to do with Christmas — deer, trees, Christmas, hat, Santa, snowman and of course, Elfie Rojo. Hulk was mad because he had all vowels and couldn’t play. Don’t you hate it when that happens? All that traveling back and forth to the North Pole has made Elfie Rojo very tired, so he decided to relax and have a fruity umbrella drink. 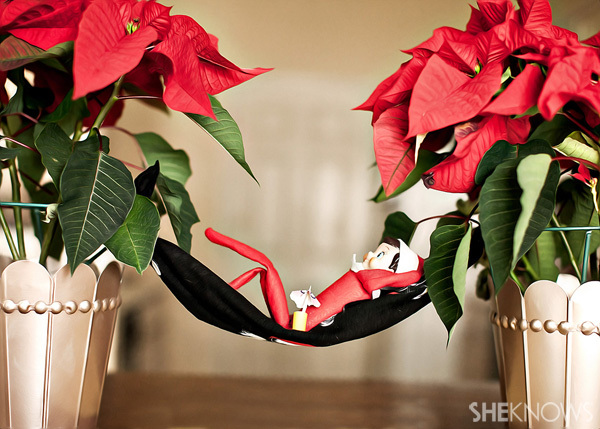 I hung a bandana between two poinsettias to make the hammock. The yellow game piece from our Trouble game became the glass, and a toothpick with a small round piece of decorative paper became the drink umbrella. I think at this point, Mommy was ready for a little R&R too. 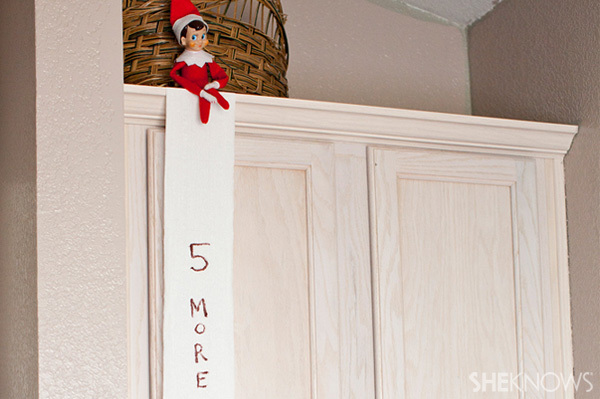 Elfie reminded the kids that there were only five more days until Christmas. He hung toilet paper from the top cabinet and used Momma’s lipstick to write his message. 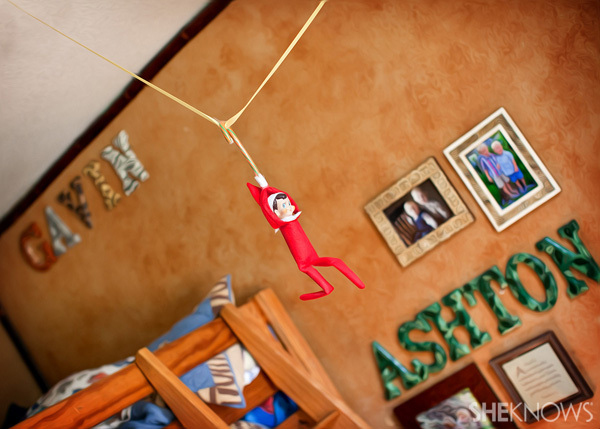 This Elf on the Shelf idea was so much fun, but a little tricky to pull off. I woke up early one morning and painted red dots on the kids’ noses about an hour before they typically wake up. I initially thought about using lipstick, but the thought of it smudging off during the night and getting on all the pillows was not pleasant. So I decided to use a washable craft paint instead. 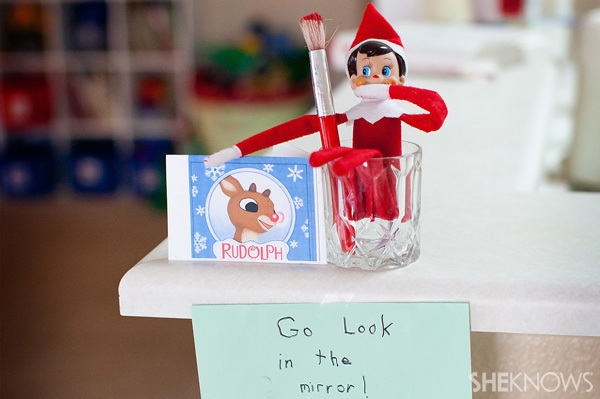 I set Elfie up on the counter so when the kids walked into the living room, they would see his note. The squeal of excitement from all three kids about this little red dot could be heard the next house over. Elfie Rojo, or should I say pirate Rojo, was found hiding in the kitchen cabinets in the Treasure Island skull mug my husband bought during one of his trips to Las Vegas. His pirate eye patch is made from a tiny piece of black craft paper and tied with some elastic string. Elfie brought his own red Santa bag with little gifts for everyone. Each child received small do-it-yourself Christmas ornaments to make that morning after breakfast. Note: These types of ornaments can be found fairly inexpensively at any craft store or dollar store. For Elfie’s Santa beard, I first cut a small paper beard. Next, I pulled off tiny bits of cotton ball and rolled them into smaller balls to glue to the paper beard. And once again, a good-size piece of double-sided tape kept the beard on Elfie’s face. 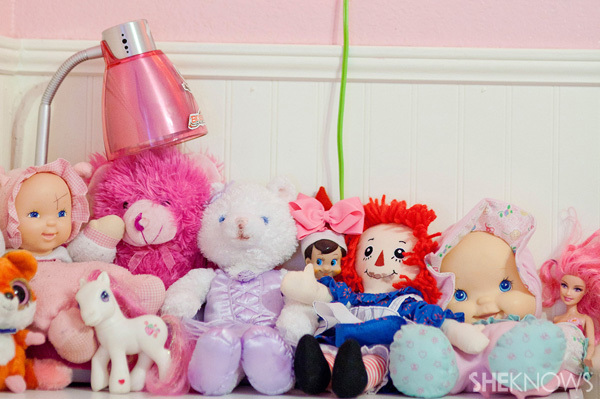 I spy with my little eye… Elfie Rojo! This particular morning, it took the children forever to find Elfie because he was hiding so well and even disguised himself with a pink bow. 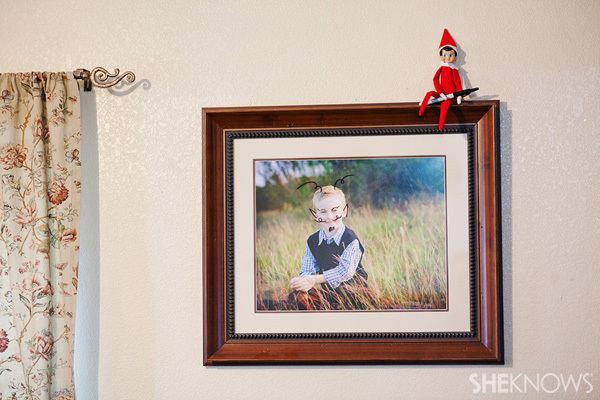 The children found Elfie perched up on one of our framed photos and he had drawn a silly mustache and other doodles on my oldest son’s picture. The kids thought this was a riot and laughed hysterically. I actually used a Sharpie marker, which I tested beforehand to make sure it would come off. However, if I had a dry erase marker, it would have worked better and saved me a bit of scrubbing. 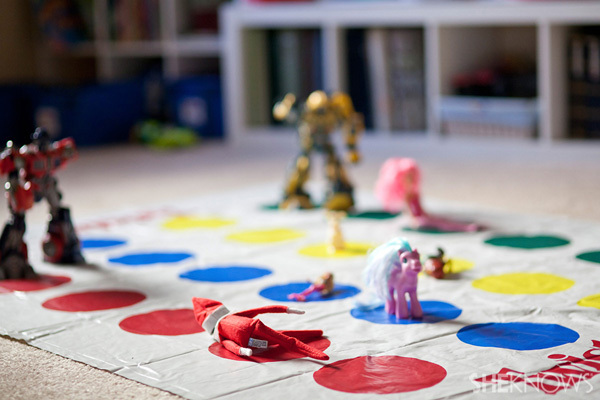 Elfie Rojo and his friends stayed up late playing Twister. He was actually in a sitting position when I went to bed that night, but by morning, he was slumped over. Fortunately, I think it made him look more genuine because it looked like he couldn’t stay on his color and fell over — which is fairly typical in the game of Twister. 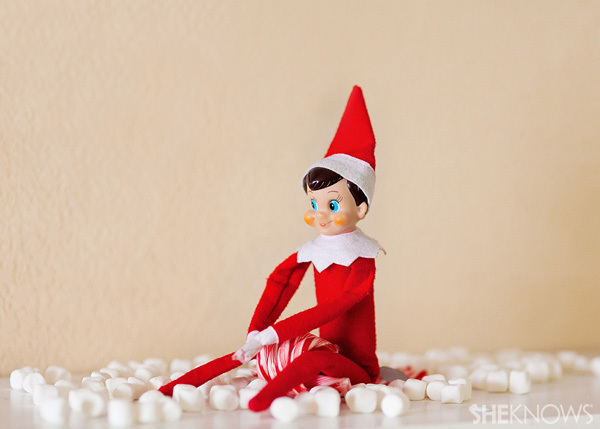 Elfie was found riding a candy cane sled in some marshmallow snow. Once again, the “snow” did not last very long with three hungry munchkins in the house. What was once a large mound of snow was whittled down to just a few snowballs by the time I came back with my camera. The candy cane sled was easy to make: Just hot-glue a couple of candy canes together and set to dry. Elfie Rojo hung mistletoe in the middle of our hallway, which is the busiest area of our house because it connects our living room to the bedrooms. We found ourselves giving lots of hugs and kisses to one another that day — a perfect reminder of what Christmas is all about. I am so flattered! 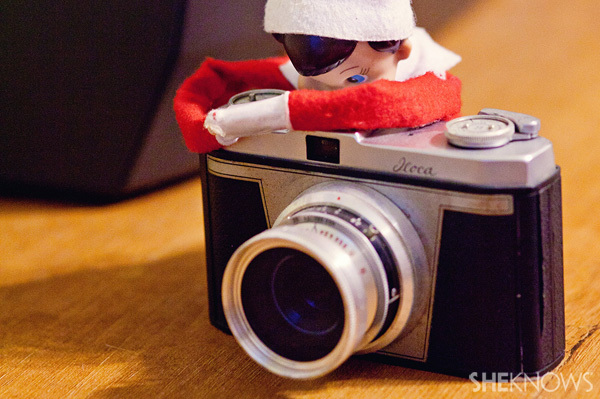 The kids found Elfie in my office taking pictures with my old Iloca camera. His models were five McDonald’s Happy Meal figurines. 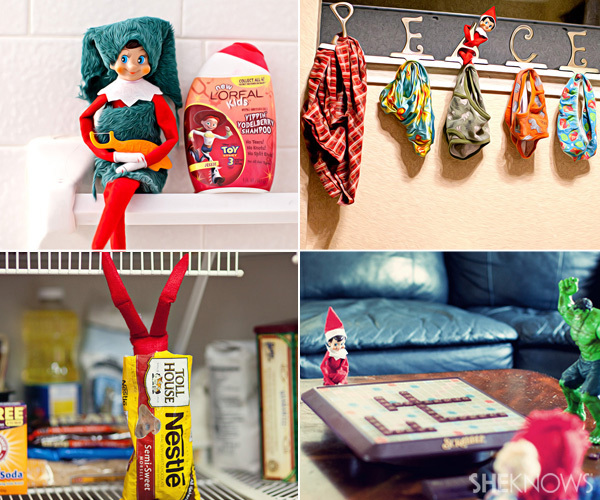 Our silly Elfie was found in the pantry this morning, head-down in a bag of half-eaten chocolate chips. This was actually a great cover for me. You see, I love chocolate too, and the night before, I found myself eating chocolate chips by the handful and watching a movie. Thanks for taking one for the team and covering for a fellow chocoholic, Elfie. Once again, Elfie Rojo proved very tough to find this particular morning. The kids searched and searched all over the house, not realizing he was outside. 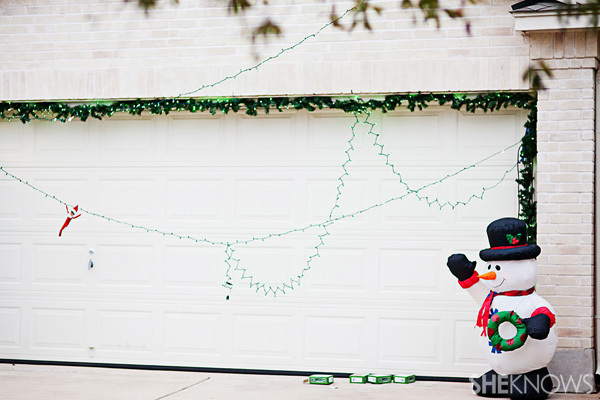 It looks like he was trying to hang Christmas lights on our house — and also trying to drop a subtle hint to us parents that it was time to get this done. But being the tiny elf that he is, he just couldn’t quite make it to the roof. A version of this article was originally published in November 2012.